Oh, today I've got some awesome looks to share with you, darling. We are going to see marvelous outfits featuring pastel blazers. I tell you honestly, I am so in love with them. Why? They are absolute winners in summertime and each one of them reminds me of hot summer days when it's fall or winter outside. It's an elegant way how you can update your clothing color palette with just a little change what will totally modify your look. In this post I tried to gather various combos and ideas on how to pair your pastel blazers with your everyday and dressy clothing. 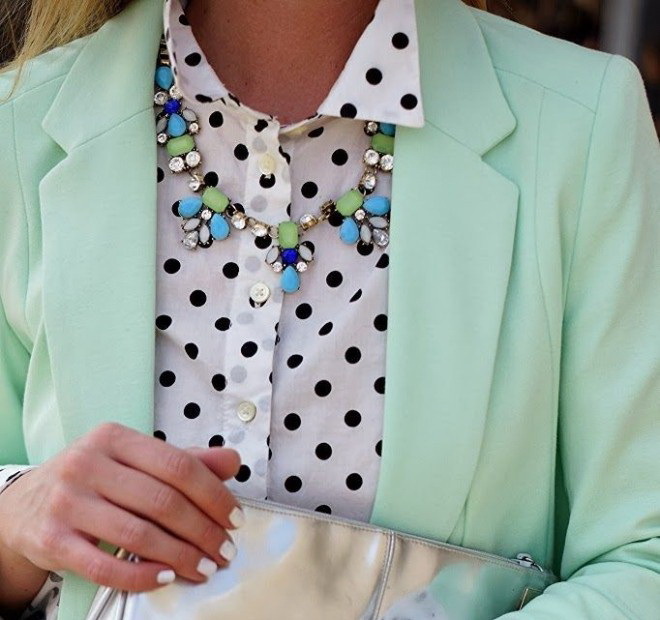 We see a pale mint blazer worn atop white shirt in black polka dots. The look is completed thanks to beautiful necklace. You can combine your pastels with leather, making you look a bit edgy. Personally, I don't like this kind of styling, because I consider pastel to be elegant hue what can be seen on tailored looks. But you can wear it with leather skinnies if you are feeling yourself too sweet. You can style it with more neutral hues, like black or white. I like wearing pale mint colored jacket with white t-shirt anc combine it with navy blue midi skirt. If you think it's too girlish, then you can add edgy feelings by completing this look with black leather cross body bag, or studded clutch with gold chain handle what will add a perfect edgy touch. You can always pair your elegant pastel suit jacket with distressed jeans or cut-offs,. 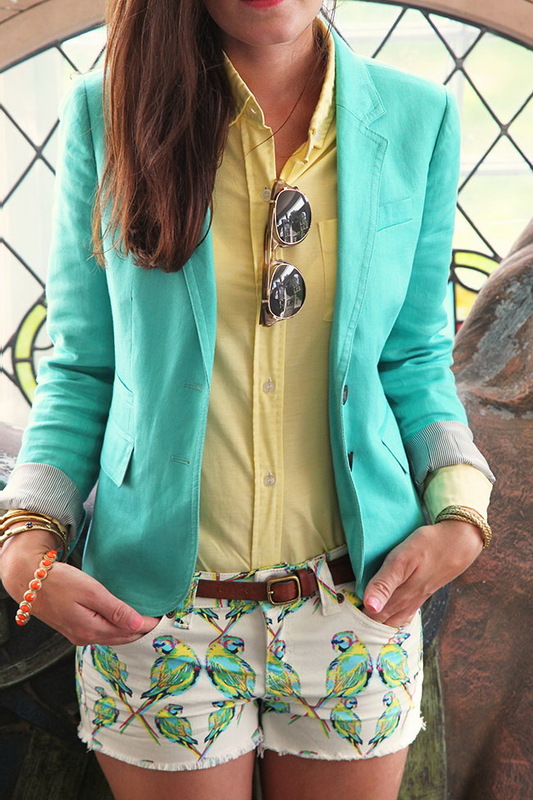 Don't limit yourself, pair your pastel blazer with other pastel shades, so you can achieve a color blocking look. Some ladies prefer totally white look (separates or jumpsuit) covered with a pastel blazer. Anyway, there are thousands and thousands of cool ideas, so you better take a closer look at these combos and choose your favorites. Don't forget to tell me in comments your beloved styles.